It was on February 2, 1968 at the world-famous Marquee Club in Wardour Street that Jethro Tull first performed under that name. The group would go on to become one of the most successful and enduring bands of their era, selling over 60 million albums worldwide and entering the cultural collective consciousness along the way. 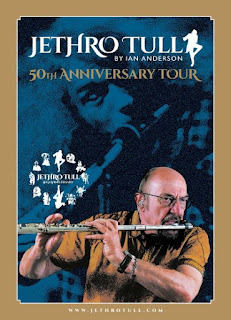 To celebrate this golden anniversary, Ian Anderson will present 50 years of Jethro Tull in summertime U.S. concerts, as part of the worldwide touring schedule. The debut album, This Was, was released later that same year. Founder, frontman and flautist Ian Anderson is rightly credited with introducing the flute to rock as a front line instrument, not to mention the codpiece. Jethro Tull are one of the biggest selling progressive rock artists of all time, and the group’s immense and diverse catalog of work encompasses folk, blues, classical and heavy rock stylings. The anniversary concerts will feature a broad mix of material, some of it focusing on the earlier formative period through to the “heavy hitters” of the Tull catalog from the albums This Was, Stand Up, Benefit, Aqualung, Thick As A Brick, Too Old To Rock And Roll: Too Young To Die, Songs From The Wood, Heavy Horses, Crest Of A Knaveand even a touch of TAAB2 from 2012. Ian Anderson is accompanied by Tull band musicians David Goodier (bass), John O'Hara (keyboards), Florian Opahle (guitar), Scott Hammond (drums) and surprise virtual guests. Formed in 1968, Jethro Tull have released 30 studio and live albums, selling more than 60 million copies worldwide. During their 50-year history, the band has performed over 3,000 concerts in more than 50 countries, playing 100+ concerts each year.